The four seasons, of fall, winter, summer, and spring, is not just about the weather conditions but about the holidays and spending time with those who you care and love the most. But most of all, the music that falls in-between all of it, thus includes musician Greg Herriges and his most recent release "Christmas! Revel and Ritual: Holiday Music for the World". This album of sorts, brings together his genre choices of folk, rock, world, and acoustic. Together he brings all of the holidays into one solid collection of works, that it becomes a pure classic rather instantly. Like take such tracks as "Birjina Gazetto Bat Zegoen (Trad. Basque)", the opener being clearly a tale of angels, takes the listener on a journey out of this world, that you become fond of the track more so than normal. When another track like “Sakura, Sakura (Trad. Japanese)", is more in-depth with the listener, the tune becoming more mellow yet grounded and fair. It soothes you and creates this pace of peace and guidance. Whereas a track like "Shchedryk (Trad. Ukrainian)", is more upfront and being traditional, that all should know it. Hearing such a familiarity makes the track more fun to the ear, that it becomes pure joy from every note played out. When it comes down to this album, Greg Herriges’ style is so filled with spirit and grace, it becomes magical in all its containment. After playing through the album at least once, you are taken into the holiday spectrum never to forget it. Hearing such an album as “Christmas! 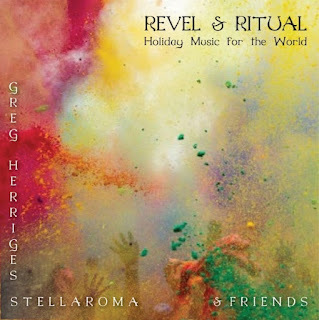 Reveal and Ritual: Holiday Music for the World”, does take you to a whole another world, a new one that you can partake in and wonder how it can turn out, with such merry and glee, no other words to depict its passion of music and timely year.